Urrutia map and detail showing pair of rectangular domestic structures in approximate location of the Southeast House Complex. The two rectangular buildings Urrutia saw in 1767 were probably not the same structures, since the excavated materials from the southeast date no later than 1750. Termed the Southeast House Complex by the archeologists, this most intriguing pair of adjacent residential structures lay outside the presidio. A peculiar set of artifacts found within the one fully excavated structure, which was probably a kitchen, strongly hints that one of the house's occupants was a curandera or folk healer, and that the house complex dates to before 1750. 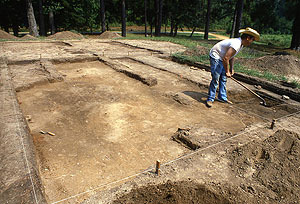 This house complex was found by Pete Gregory in 1982 during testing and trenching carried out to explore an area that now serves as the parking lot of the visitor center. Upon encountering structural evidence, the archeologists began opening up a series of hand-excavated units, following the architectural features as completely as time allowed. The excavated area ultimately formed a somewhat irregular block area . The archeologists encountered a complex set of postholes, wall remnants, trash deposits, and layered cooking pits within which were found well-preserved clusters of unusual artifacts. Interpreting this set of features and finds is quite challenging in part because time did not allow the exploration of an area where an associated house structure is believed to have stood. Nonetheless, a fascinating if tentative story emerges from the documented evidence. The house complex lies southeast of the presidio not far from the southeast bastion. 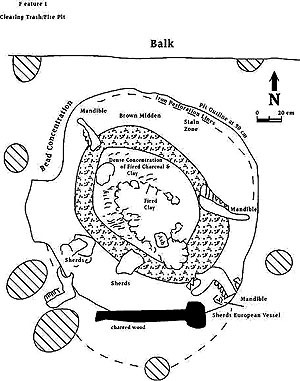 The Urrutia map shows a pair of structures at approximately the same location, although the two rectangular buildings he saw in 1767 were probably not the same structures, since the excavated materials appear to date no later than 1750. 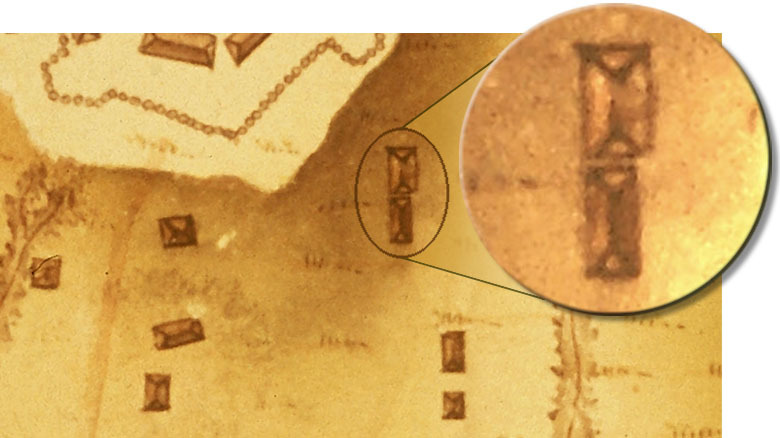 On the Urrutia map, the many structures shown outside of and surrounding the presidio, as well as those near the mission complex clearly represent houses and associated domestic structures where married soldiers and other Adaeseños lived. It is to be expected that older structures were abandoned as they deteriorated beyond repair, and that useful timber and furnishings were robbed and used to build new residences nearby. By carefully studying the Urrutia map one can see an oft-repeated pattern of paired structures, one usually smaller than the other and sometimes turned with a perpendicular axis. Based on archeological evidence in several areas, many of these pairs are suspected to represent a primary residence and an associated kitchen and food preparation area. Doing the cooking and food preparation in a separate outbuilding makes a great deal of practical sense. Some of the documented fire pits are large and would have generated plenty of smoke and heat. The smoking of meat must have been a regular occurrence as meat from livestock is the main economic product that Los Adaes is known to have generated (apart from illicit trade items). With these considerations in mind, let's turn back to the Southeast House Complex. The accompanying plan map shows the major features and structural interpretation. 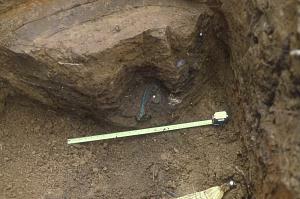 Only one structure was clearly defined and almost fully excavated. It appears to have been an open-air kitchen with a solid western wall and three open sides. Based on the wall remnant and two corner posts, the structure was somewhat asymmetrical, but roughly square with three walls measuring about 25' in length and the odd wall about 20.' Within the kitchen building is a central cooking pit, Feature 1, that appears to have been within a small walled enclosure roughly 7' across as defined by a series of small postholes. The cooking pit was about two feet deep and had evidence of intense burning and multiple episodes of use. The upper part of the pit was filled with a brown midden layer that represents accumulated trash and sediment that built up after the kitchen was no longer in use. As the archeologists removed the midden fill, the pit itself appeared as a dark circular stain with an intensely carbon-stained central area and containing numerous fragments of fire-reddened (baked) clay fill, clear evidence of very hot fires. As the upper fill was removed, four cow mandibles (lower jawbones) were exposed on the pit edges, each arranged such that the distal ends of the mandibles pointed outward. The four were aligned on symmetrical intercardinal axes, NE-SW-SE-NE. 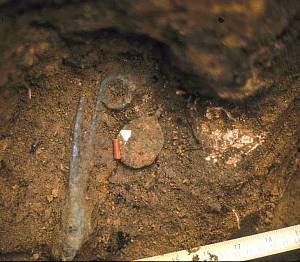 A concentration of blue and red beads was found on the NE edge of the pit, probably representing a necklace. 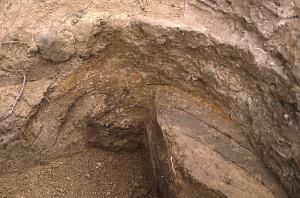 The lower pit contained alternating layers of carbon-stained clay, kitchen refuse, and clean sandy loam. These appear to be intentional linings of the floor and walls of the pit and representing different periods of use and reuse. At the base of the pit an unusual artifact cluster was found containing a brass wick trimmer, a tubular red glass trade bead, a religious medallion, and egg shell (the shell was fragmented and could represent several chicken eggs). These artifacts appear to have been intentionally placed as a ritual offering. Chicken eggs are rubbed on people to remove the negative effects of the mal de ojo or evil eye. This folk healing cure has been documented in northwestern Louisiana and all the way into Mexico. 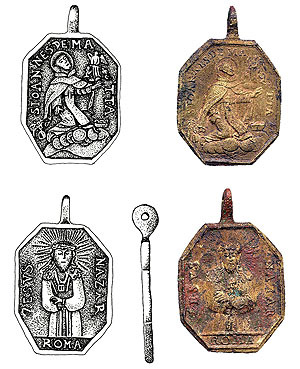 The medallion is that of St. John of Matha, a canonized saint who lived during the Middle Ages (1160-1213) and is notable for his ministry to Christians who had been captured by the Turks and held as slaves. St. John of Matha was canonized in 1655 and is the patron saint of prisoners, so he was a relatively new saint at the time Los Adaes was settled (1721). Since some of the original soldiers were recruited out of the jails, the presence of a religious medallion depicting St. John of Matha is not surprising. The deliberately placed cow mandibles and the unusual artifact cluster at the base of the pit was interpreted as representing two episodes of ritual behavior. These two "offering events" must have been widely separated in time. During the first, the artifact cluster was deposited at the base of the pit, early in the history of the use of the cooking area. The cow mandibles, and perhaps the bead necklace, were placed around the pit late in its history. The ritual behaviors evidenced by the Feature 1 finds may have been carried out as part of healing rituals by a curandera, or folk healer. Curanderismo is widely practiced in Latin America and can be defined as "a set of traditional beliefs, rituals, and practices that address the physical, spiritual, psychological, and social needs of the people who use it," according to the online Encyclopedia of Alternative Medicine. This Latin American folk medicine practice has been documented and studied by many scholars (see Credits and Sources for several recent references). Curanderismo contains elements derived from both Mesoamerican and Spanish cultures. In brief, a curandera or curandero (female or male healer) carries out prayers and healing sessions for spiritual cleaning and to protect against evil spirits. Among the items commonly used are eggs, candles, pictures of saints, animal bones, herbs, and holy water. While traces of herbs or holy water wouldn't be preserved archeologically, the egg shell, St. John of Matha medallion, and the candle wick trimmer found at the base of Feature 1 seem quite suggestive of ritual healing as do the intercardinally oriented cattle mandibles. One additional element in the possible curandersimo interpretation of the Feature 1 area is the fact that African slaves from Louisiana would sometimes escape to Los Adaes from French Louisiana because slavery was generally not allowed in Spanish Texas. Francis Galán has found archival evidence that two enslaved people were sold at Los Adaes. Since St. John of Matha was the patron saint of imprisoned or enslaved people, the medallion of St. John of Matha might also have been used by a curandera to help an enslaved person. This is purely a conjecture, of course, but nevertheless, the placement of artifacts in Feature 1 allows for this type of explanation. Further, the only archeological evidence for healing found at Los Adaes—a fragment of an apothecary or drug jar—was recovered from Feature 2, which is roughly 6 meters (20 feet) away from Feature 1. 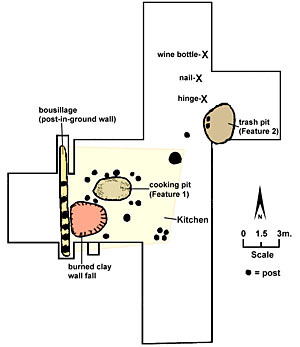 About 10 feet to the northeast of the northeast corner of the kitchen is a large deep trash pit some 2 meters (6 feet) across and almost a meter (3 feet) deep that had been capped (sealed) with a layer of clay. Within the pit were a wrought iron skewer, a broken rapier (sword) tip, some other iron artifacts including iron spurs, many fragments of Indian-made pottery and four whole cow skulls. The cow skulls were intact, although one had had the horn cut off. They were intact so the brains had not been eaten. It looked to Gregory as if the pit had been dug to bury the beef bones, then left open and used for a dump for a protracted period. This trash pit had no evidence that direct cooking had taken place within it. It was filled with trash, discarded bones, and coarse sand and dirt. It had a final clay cap. The evidence for the associated house to the northeast of the kitchen is based on concentrations of nails and some post molds. This area was not completely excavated because it was not going to be destroyed by the construction of the parking lot. Pete Gregory and Aubra Lee disagree as to whether a house is indeed represented—future archeological investigations would clarify this matter. Southeast House excavation block looking west early in the 1982 season. Pete Gregory is removing the upper dark midden fill as he attempts to define Feature 2. Behind him, on the left side of the picture the dark stain of Feature 1 is visible. Plan of the Southeast House Complex excavation block showing the major features and inferred structural outlines. 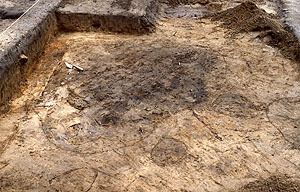 Feature 1, the large cooking pit, as it was first recognized. Feature 1 as it was further exposed —note evidence of intense burning including fire-reddened clay. Plan map of the upper part of Feature 1 based on field drawing by Gregory. The circular hachured areas are postholes. Note the locations and orientations of the cow mandibles. 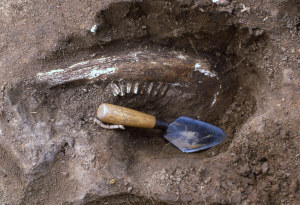 One of four cow mandibles intentionally placed at the edges of the Feature 1 pit, each arranged such that the distal ends of the mandibles pointed outward. The four were aligned on symmetrical and intercardinal axes NE-SW-SE-NE. 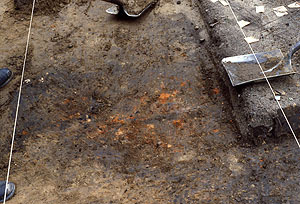 View of partially excavated large cooking pit, Feature 1, which had internal layers of carbon-stained clay, clean sandy loam, and kitchen refuse, suggesting that the cooking area had been resurfaced several times. Overview showing the placement of the artifact cluster at the base of the Feature 1 pit. Close up showing an unusual artifact cluster containing, a wick trimmer, a red glass trade bead, a religious medallion, and egg shell. These artifacts appear to have been placed intentionally as ritual offering. The medallion is that of St. John of Matha, the patron saint of prisoners.